We believe that a better world is possible and that it may become probable only by investing in knowledge, innovation and talent. We are a young company but with an extensive history behind, boasting its roots in Olivetti, Ivrea, from which Eustema Spa was founded, the company that gave life to Eulab Consulting – through a spin-off. Born as knowledge company to offer useful and innovative training on the market, also supported by new e-learning methods, our company grew in just a few years, expanding its training offer – attaining a leader role at national level -, with the integration of research and consulting services. The registered office is in Rome, but we also operate on the entire national territory, also thanks to our local branches in Milan, Naples and Chieti. The office in Rome boasts the trainingcertificate of Lazio Region. Our top corporate value is concreteness. We believe that our main duty consists in always ensuring the quality of our services. For this reason, all our production processes are ISO 9001 (EA33, EA35 and EA37) certified. We are convinced that the value of labour must lead our professional activity. We are pleased to have adopted the principles set forth by SA 8000, the first international standard that promotes and ensures ethic compliance with labour laws. We care about our human resources and to safeguard and protect them, we chose to adopt all the standards set forth by OHSAS 18001 certification. We respect and protect the environment and we received the ISO 14001 certification for our focus on environmental topics and energy saving. Knowledge and awareness represent – since always – the drive for progress and human wellness. During the next few years, investments and efforts will be significantly boosted, that will have the following as goal: the «production» of new knowledge, «conservation and maintenance» of knowledge, and the «diffusion» of know-how. Within this scenario, Eulab Consulting operates in knowledge management, offering services within the entire cycle of knowledge. The cycle of knowledge foresees at least three phases in its simplest form: Production, Conservation (filing and maintenance) and Diffusion. Within the cycle of knowledge, it is possible to identify two summary dimensions: on one hand, Knowledge vs. Learning (Production of knowledge vs. Diffusion of knowledge), on the other hand, Human vs. Assisted (Human factor vs. Support of IT technology). 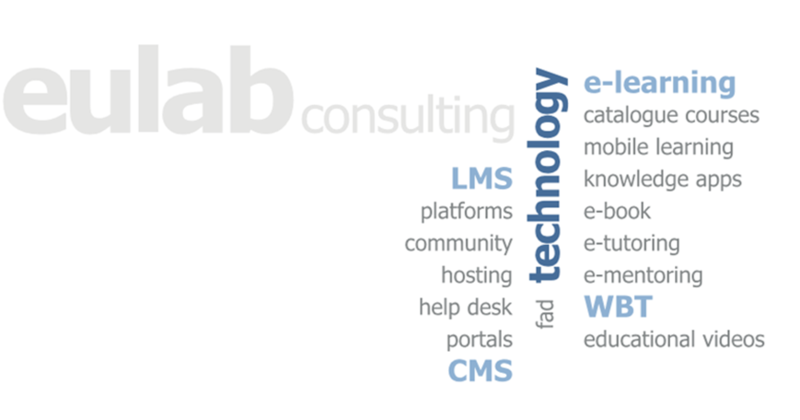 The interaction between the two dimensions generates the four spheres of Eulab Consulting’s activities: Training, Research, Consulting and Technologies for knowledge. Learning area. Specialized in diffusing knowledge. We offer catalogue and «tailor-made» training courses. We rely on a task force specialized in procuring financing for training. Knowledge area. Experts in supporting customers in the production process of personal knowledge (individual and group coaching activities) and within their contexts (social and market researches). Technology area. Innovative and reliable, among the best in Italy, in the computerized management of corporate know-how (CMS and LMS systems). Experts in offering e-learning courses. We offer corporate training courses. We boast a catalogue – always updated – of approx. 500 courses to build and strengthen the skills of workers and managers and winning the new market challenges. 97.8% of the people attending our courses are satisfied of the training received, since our courses are modern, practical and stimulating. In addition to the catalogue, we also offer specific «tailor-made» courses on numerous topics and subjects, based on our clients’ needs. Specialists in training, financed by inter-professional funds or structural funds. We assist hundreds of companies – every day – in researches, credit applications, management, reporting and certification of financing for training activities. Within 24 hours, we carry out a complete check-up of the company and define the best strategy to apply for loans. For medium and large size companies, we offer a complete management service of their corporate training account. The recipe for our success: we combine free-of-charge training for many of our clients, to a large and excellent range of training services. We are leaders in Italy in developing social research (studies and surveys) and market (customer satisfaction and loyalty, brand positioning and benchmarking) activities. We use an integrated approach between quantitative (CATI, CAPI and CAWI interviews) and qualitative (narrative interviews, focus groups, participant observation) techniques. We help companies growing, by offering on demand specialized consulting services (HR management, communication and marketing), also through temporary management. We are specialized in coaching activities: individual (top and middle management) and group (to support the production or sales teams in attaining their goals). We carry out activities inspired to positive psychology to improve wellness or define career plans (orientation). Experts in Structural Funds, we assist the Public Administration (technical assistance and operational support for management) and enterprises (we research, plan and manage ESF, ERDF, EAFRD financing opportunities). We are the partner you can count on to face and win the challenge of change, thanks to our cutting-edge and effective consulting services. We develop multimedia products and e-learning training courses. We feature the widest-ranging catalogue in Italy (over 250 titles). We build specific and tailor-made Web-Based Training modules (WBT) for our clients. We offer e-tutoring and e-mentoring services. The WBT are the ideal tool to train a high number of students within quick timeframes and contained costs, for example on procedural or highly specialized aspects, also through educational videos. Our WBT ensure a high learning level because designed in line with the needs and characteristics of each client. We have been the first in Italy to have «brought knowledge in the workers’ pockets», creating e-books, mobile learning and knowledge apps that can be used on smartphone and tablet. We support the design, development, customization and maintenance of Content Management Systems (CMS) and Learning Management Systems (LMS). Knowledge is the green energy of companies of the future. Being able to produce it, manage and distribute it represents the great challenge for tomorrow’s firms. Our technology is already offering endless possibility for improving and boosting corporate performances.